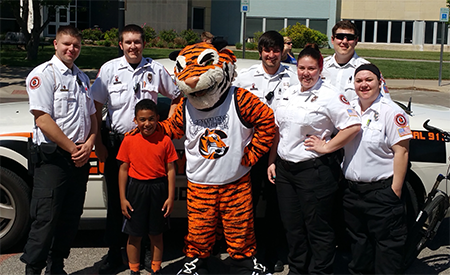 On Saturday, April 23 Cowley College participated in the Wichita Police Department Law Enforcement Appreciation Parade. Criminal justice students Cordel Gallagher, Jeff Pentland, Josh Atkins, Bo Rose, Emily Westfall, and Renae Huff took part in the parade by riding patrol bikes the Cowley College patrol car in the parade. Also present were Rachel Schmeidler, Cowley College coordinator of military services, Josh Cobble, executive director of enrollment management, and Tank the Tiger. Criminal justice instructor Frank Owens was happy for the opportunity to have his students take part in the parade. “They told me they had a great time,” Owens said. The college looks forward to participating in the parade again next year. As a bonus, several Cowley students were approached about pursuing a career with local agencies in the Wichita area.